ARLINGTON, Va.–It's an extreme makeover, U.S. Navy-style. The research vessel (R/V) Thomas G. Thompson recently completed an 18-month upgrade to extend its working life, improve operating systems, and bolster its research capabilities for the Navy and scientific organizations. The University of Washington has operated and maintained the Navy-owned Thompson since 1991, under a charter lease agreement with the Office of Naval Research (ONR)–which manages the ship on behalf of the service. "The refit of the R/V Thompson provides a continued global capability of support to Navy and national oceanographic research objectives," said Dr. Tom Drake, head of ONR's Ocean Battlespace Sensing Department. "It also enables additional years of service, hundreds of thousands of ocean miles sailed, research opportunities for thousands of scientists, and the training of the next generation of sea-going scientists and technicians." During the mid-life refit–conducted in Seattle, Washington, by Vigor Shipyard–the Thompson was refurbished from stem to stern, throughout all five of its decks. It received brand-new diesel engines that run cleaner and more efficiently than before. The 274-foot vessel boasts the latest navigation and ship-positioning systems–as well as sophisticated sonar, allowing it to map the ocean floor in sharper detail and even differentiate between species of fish and other marine life. The $52 million refit–which was sponsored by ONR, the University of Washington and the National Science Foundation–is a much better price tag than the $200 million it would have cost to build a new research vessel. And it will extend the Thompson's life by another 15-20 years. Since finishing the refit earlier this year, the revamped Thompson has sailed to New Zealand and Taiwan–and will travel to India, Sri Lanka, the Philippines, South Africa and Australia in coming months. Research projects include using special floats to measure the ocean's temperature and salinity, mapping underwater mountains, and studying the heat flow generated by an aquatic volcano and hot springs. 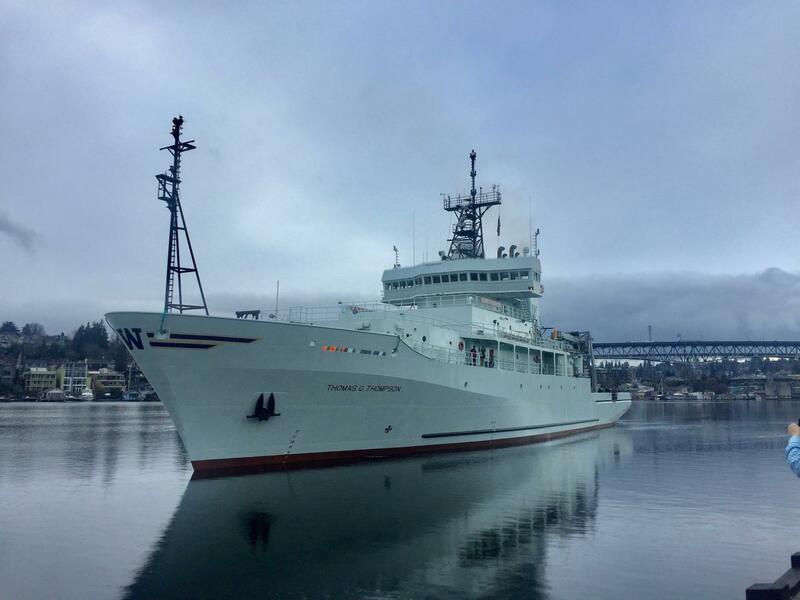 "The R/V Thompson has performed very well since its refit, and the crew has provided positive feedback," said Douglas Russell, the University of Washington's manager of marine operations. "They especially appreciate things like the improved air conditioning and heating systems, water-making and sewage plants, and the new drainage system–things you don't think about until you're out at sea and really need them to work well." The Thompson is one of three Navy-owned research vessels up for refit in coming years. The R/V Roger Revelle, operated by Scripps Institution of Oceanography since 1996, will begin its refit in 2019. The R/V Atlantis, operated by the Woods Hole Oceanographic Institution since 1997, is scheduled for refit in 2020. Since the end of World War II, the Navy has provided state-of-the-art research ships to select universities and oceanographic institutions to perform scientific studies of the marine environment. Currently, the Navy owns six of these vessels–part of the U.S. Academic Research Fleet, whose research at sea supports Navy and national oceanographic research objectives and trains the next generation of oceanographers.